e sisters also have diabetes, both of which were diagnosed at fairly young ages. I have also recently learned that my grandmother on my fathers side, also had diabetes. Veanne’s profile was posted, and featured on Natural Muscle Hawaii in October of 2004. Wow, I can’t believe it has been over 10 years already. At that time, she had recently competed in the Aloha Natural Muscle & Fitness Classic, Ms. Fitness division. I’m not sure what ever happen to that division in the fitness world, but it seems more and more rare these days. You can check out her profile and photos here. Tricia was originally featured on Natural Muscle Hawaii back in the 1st quarter of 2006. At that time she had already won a few titles. You can take a look at her 2006 Profile here. I met Terry along with another Buddy back in 2003 at a show in Maui. So again, keep in mind that his profile is a little dated. Fitness Hiking By: Roland Ho Jr.
As someone who has been hiking the trails of Hawaii for the last 20 years or so, I have noticed that the activity has taken on a whole new meaning. When I first started hiking the local trails it was to; Explore the mountains & outdoors of Hawaii, Experience & enjoy what nature had to offer, Enjoy the hike, and maybe get a little cardio in. As a bodybuilder, I am aware that walking is one of the best forms of cardio for burning fat. So, I can definitely see the health benefits of hiking. However, these days it seems that there are many inexperienced hikers that are now hiking for primarily the fitness aspect. Hiking for health is great, but it presents a problem when those hiking have no knowledge of the trails, respect for the land (aina), are unprepared, unaware of their limitations, and have little to no respect for the communities they pass through to get to the trails. When I first started hiking we studied the trails. Did some research, and read books written by experienced hikers to understand what to expect of the trail before charging up it. These days, with technology, the Internet, and social media there is so much information it can make your head spin. Some are good, some not so good. However, this has also contributed to an explosion of hikers on the trails. I remember when you could hike trails, and be on it all day, and not come across a single person. These days, you will often see hundreds of people while on a hike. Personally, this sometimes takes the enjoyment out of the hike. One of the greatest things about hiking, is the solitude. Being out in the forest, the mountain, in nature, in peace and quiet. Sadly, many of the trails these days, at lest here in Hawaii, have turned into somewhat of an amusement park. This is also where many of the problems occur. People hiking purely for amusement, are not necessarily aware of their surrounding conditions. In fact many of the rescues that are made to retrieve lost, stranded, or injured hikers, are a large majority of visitors, or people who have recently moved to Hawaii. 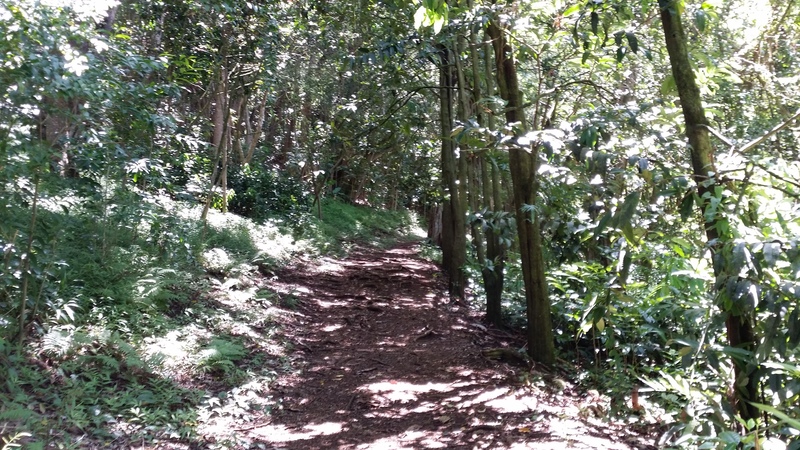 Now, I am in no way saying that if you are a visitor or new to Hawaii that you should not be hiking the trails of Hawaii. The trails are definitely there for everyone to enjoy. The concern is that, many visitors and new residence of the Islands may just charge straight toward advanced hikes without first getting acquainted to hiking in Hawaii. Many of the hikes are not even open to the public. The visitor, the person new to the islands, or someone just starting to hike should start off slow. There are many trails that are open to the public, well maintained and at various levels. You can find many of the trails listed on the state Trail Access System website Na Ala Hele. The website lists 43 trails, just on Oahu alone. That should be enough to keep you busy for awhile. Also, please make sure you have proper equipment. At least enough water and a decent pair of hiking shoes. Do some research. Get some books on the trails in the area you plan to hike, and know your fitness level. In addition, if you want to explore trails that may not be open to the public, do it the right way. Go with an organization that has been hiking the trails for years. Experienced people that can educate you on the various plants, terrain, and etiquette. The Sierra Club Hawaii Chapter and the Hawaiian Trail and Mountain Club are the two official clubs in Hawaii that I am aware of, that does just that. Have fun and be safe! Sekona Taufa, was probably the first Natural Bodybuilder to be featured on Natural Muscle Hawaii, aside from myself. In fact, I believe it was Sekona, who helped to inspire the idea of providing a website to help promote other Natural Bodybuilders and Fitness Competitors from Hawaii. It was not long after we competed together in June of 2004, that he and his wife came over to my apartment with his CD’s loaded with photos, and we put his webpage together. Back then, slapping together a website was not as simple as it is today. There was no facebook, twitter, or other social media sites. So if you wanted a webpage, you either had to figure out how to make one, or find someone who had figured it out. Sekona, did just that. When I told him I could make him a webpage, he jumped at the opportunity. So that is truly how the concept of Natural Muscle Hawaii, and promoting other competitors was born. Mahalo Sekona, for your influence with Natural Muscle Hawaii. Check out his Profile and Photos.